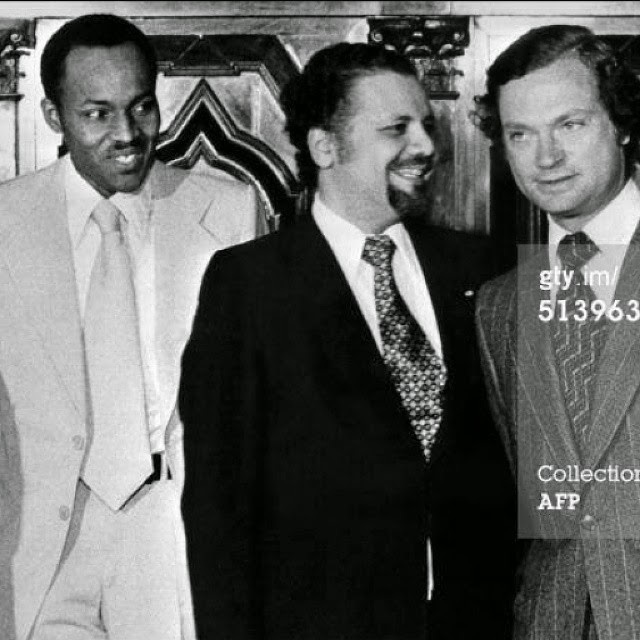 One Of These Men Wants To Be President Of Nigeria - Can You Guess? Political commentator and writer, Tolu Ogunlesi shared this throwback picture on his Instagram with the caption; "One of these men wants to be president of #Nigeria #spotthefineboy #WomensVoteSorted #Nig2015"
The man in the white suit is Rtd General Muhammadu Buhari, formerly head of state of Nigeria between 1983 and 1985. This picture was probaly taken between 1976 and 1979 when Buhari was the "Federal Commissioner" or Minister for Petroleum and Natural Resources and the head of the newly created Nigerian National Petroleum Corporationunder. He was appointed and held both offices under the then-Head of State General Olusegun Obasanjo. Buhari also briefly served - between July 1975 and February 1976 - as Governor of the then newly created North-Eastern State during the regime of Murtala Mohammed. BTW, has anyone noticed that Boko Haram is most pernicious all over the former North-Eastern state - Gombe, Bauchi, Yobe, Borno, Taraba, Adamawa - that was governed by Buhari in the seventies?